Columbus forks with Shimano dropouts???? I trying to find out more info on columbus steel frame bike that came with Zeus 2000 parts the front fork is columbus stamped but the dropouts are shimano .. never seen this before..can anyone give me more info ? Many framebuilders use Columbus fork blades/steerer tubes and source dropouts from Shimano; it's not at all unusual. My 1987 Schwinn Paramount has Columbus SL/SP tubing and Shimano forged dropouts. As do many high-end Trek frames from the early-mid 80s. It's clearly a quality frame. Is there a serial number stamped into the BB shell (or anywhere else)? Can you take a close-up photo of the Columbus tubing decal? I think I see "Cyclex" which is the Columbus alloy used for SL, SP, SLX, SPX, TSX, etc., but it almost looks like there are characters from a different (Greek or Cyrillic maybe?) alphabet. no marking or stamps other than the columbus stamp on steer tube and shimano dropouts looks like it was powder coated ..here is the clombus decal on the down tube . Well, the decal suggests that the frame has been repainted ("RIVERNICIATO") at some point, and by somebody who cared enough to make that fact clear. Shimano dropouts may indicate an American builder, probably early 80s, as those "UF" semi-vertical dropouts were only made for a few years in the early 80s. What's the BB shell thread? I am looking to purchase this frame.It's pretty much the same as pinch1967 frame.What you think..? Logo on the head tube is Husqvarna.I know that they produced motorcycle,but bicycle..? My Trek 910 has Columbus tubing, including the front fork, and the rear dropouts are Campy and I believe the front fork dropout's are Shimano. I'll need to look later to be sure. It has a Husqvarna logo on the head tube. Today they are known for motorcycles and chainsaws but they produced a lot of urban transportation bikes in the past. Looks like a decent frame from the mid 80's that could have have been built by a multitude of makers. Last edited by verktyg; 11-26-15 at 09:05 AM. That frame has classic French style fish mouth tubing ends at the dropouts so I suspect that it's a French made frame??? More pictutures would help a lot. Last edited by verktyg; 11-30-15 at 12:41 PM. I have two more pictures.Fork is Columbus Aelle,frame,who knows..
That was my thought- the Shimano dropouts went on the high-end bikes. Early 80's Klein Team Super road bikes also used Columbus fork blades with Shimano tips. On a fork they are properly called fork ends (or fork tips) whereas on the rear of the frame they are dropouts (if indeed they have forward-facing slots) or track ends (if backward-facing slots). And just to hammer an old point: a fork is singular unless referring to more than one fork, the 2 "legs" on a typical fork are the blades or the tubes (if on a telescoping-type suspension fork) and those terms are plural when 2 are being discussed. A fork is not like a "pair of pants", though it may resemble one to some. I'm not a paid professional grammer-nazi, but since the regular guys were not stepping up, I stepped in. This an unassailable claim only is one is firmly convinced that typical American usage is 'more correct' than, say, UK usage. This is a rather common conviction in fora where most users are US-based, but one can (hopefully) forgive the English (or some Canadians) for finding the claim less than fully convincing. "(usually forks) Each of a pair of supports in which a bicycle or motorcycle wheel revolves." The entry for the same word, US English, implies the usage you suggest: "a unit consisting of a pair of supports [...]"
Apologies for the drift from the main thrust of this thread. Husqvarna also at one time produced high end Firearms. I had not considered there was a regional usage for this term, so mea culpa and apologies to those who might speak British English. It occurs to me that if you parse this term even more than a rational human should (that's me!) you can see that each blade of a fork (or forks) has a split at the end that might be thought of as two "tines", so resembling a different kind of fork: road/tuning/meat, etc. and then it makes more sense how this assembly might be seen as a pair and not a unit. Pants (or trousers if you're British) used to be 2 separate legs (pants)so not really a unit until later joined into one garment and still we call that single thing a "pair" of pants (or trousers). I once dug up the historic examples of usage and etymological notes on this question from the expanded OED and elsewhere, but I forget most of the details. The variance in usage (it seems to me) is quite possibly rooted in a more general notion contained in (2.1) of the Oxford Dictionary online (UK English) definition I linked above: "Either of two forked parts"...as in "the left fork goes on to the village". Very much parallel to the case with cycling terminology, I've seen exactly this example dismissed by some as a poor use of language. Rather, it simply represents an alternative usage, and one with centuries of etymological precedent behind it. Your reasoning regarding 'fork ends' themselves presenting a split that might be thought of a two 'tines' has a certain logic to it as well. SL or SP main tubes with Aelle forks and rear stays.... or at least that's what my 1981 Bianchi Campione del Mondo is made of. When I bought it I thought that Tretubi meant "triple butted" or something... silly me! Later I'd heard that those Bianchi frames were made of Columbus SL main tubes with Falck forks and stays. Took years to find out what "Trebubi" was - at least in the case of my bike. 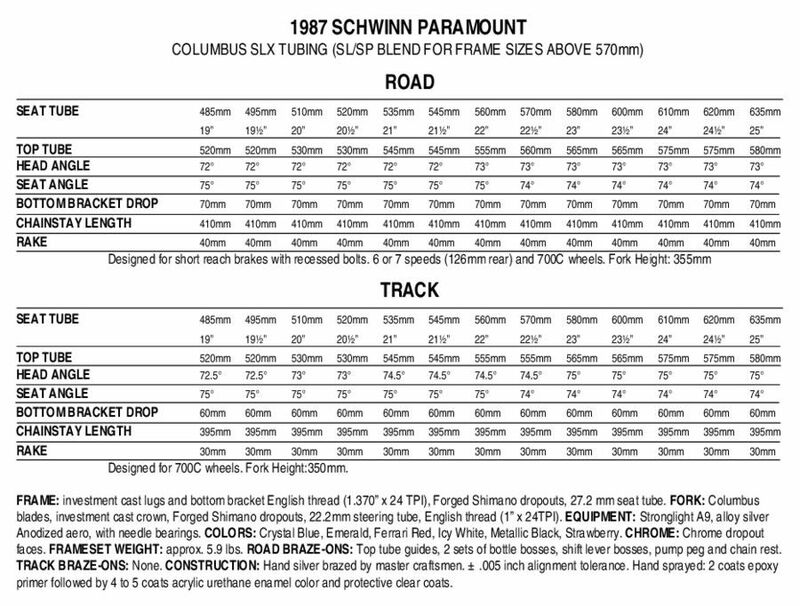 Found this 1982 Bianchi spec sheet. Whatever it's made of, that bike is one of the smoothest riding bikes that I own and it's one of my top 10 (or 12) favorites. So, it just goes to show that there's more to ride and handling than just what the tubing sticker says. After doing more research, I found that Tretubi just refers to the 3 main tubes, as Columbus made Tretubi stickers for a number of different types of tubing. Much like Reynolds 531 3 main tube stickers. Last edited by verktyg; 11-30-15 at 12:47 PM. Location: In my crap Apt. Bikes: Not that many, just getting started. Re: CV bike stuff, I am into it, I like it! Last edited by WolfRyder; 01-05-17 at 04:00 PM.